The legend goes that when a young Celia Cruz sang lullabies to the little ones in her Cuban household, her voice enchanted neighbors to come in and listen. As “the Queen of Salsa,” Cruz mesmerized audiences with her powerful voice for over fifty years. Shouting out “Azucar!” in between songs, her dynamic performances were highlighted by her bigger than life personality, flamboyant costumes, and passion for her music. Influencing multiple generations and crossing cultural boundaries made her an ambassador of Latino culture. Cruz initially wanted to be a teacher, but her yearning to sing pulled her into a performing career. Her family supported her career choice under the condition that chaperones—mostly older women in the family—accompany her to all her performances. Cruz agreed. After studying at Havana’s Conservatory of Music from 1947 to 1950, she sang on Cuban radio programs. She became lead singer for the island’s top dance band, La Sonora Matancera in 1950. They left Cuba shortly after Fidel Castro came into power and settled in the United States in 1961. Castro refused to let her return to Cuba, even when her parents were dying years later. In 1962, Cruz married the band’s trumpet player, Pedro Knight. He later became her manager and the inspiration for many of her songs. He was at her bedside when she died in 2003. Pursuing a singing career in the United States was difficult not only because of cultural differences but because she was up against the newest rage, rock ‘n’ roll. She persisted. By the 1970s, a resurgence of traditional Latin music found a mainstream crowd. Joining Tito Puente’s band in 1966 revived the salsa sensation and incorporated use of strong, metallic African rhythms. Cruz became an “overnight” success. Performing in international tours regularly with “the King of Salsa” gave them worldwide recognition and expanded their influence to younger generations of Latino entertainers. She appeared with many talents including Johnny Pacheco, Willie Colon, Pete Conde, Ray Barretto, Gloria Estefan, Patti Labelle, David Byrne, and Dionne Warwick over the years, even reuniting with La Sonora Matancera in 1982. 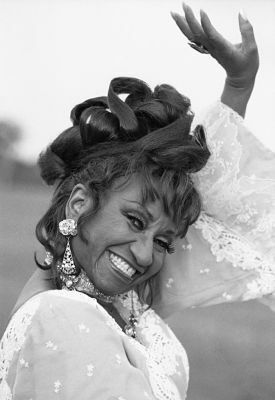 She released more than seventy-five albums including the bestselling Grandes Exitos de Celia Cruz, and Feliz Encuentro. Twenty albums turned gold. She won five Grammys and two Latin Grammy awards. Cruz appeared in movies and theater, including the film The Mambo Kings (1992) and performed in Hommy—A Latin Opera at Carnegie Hall in 1973. She has been honored with a star on the Hollywood Walk of Fame and a statue of her likeness stands in the Hollywood Wax Museum. In 1995, she was awarded the National Medal for the Arts by President Bill Clinton, making her the first Latino pop singer to earn that distinction. She earned the Hispanic Heritage Award, the Lifetime Achievement Award from the Smithsonian Institution, and the Presidential Medal of Arts award from the Republic of Colombia. Beyond music she touched lives through fundraising for AIDS, cancer awareness, orphans in Honduras, and the handicapped in Costa Rica.